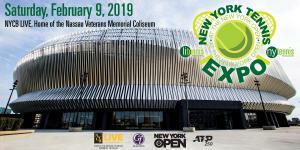 WANTAGH, NY, UNITED STATES, January 11, 2019 /EINPresswire.com/ — The 2019 New York Tennis Expo is committed to bringing the very best tennis experience to the thousands and thousands of attendees, and so we are excited to announce that legendary tennis coach Nick Bollettieri will be joining us at NYCB LIVE, Home of the Nassau Veterans Memorial Coliseum on Saturday, February 9. Click Here to preregister for your FREE tickets and complimentary parking. Bollettieri will lead and conduct two clinics during the on-court programming at the Expo, where attendees and guests can get on court and learn from the sport’s top coach. Don’t miss this amazing opportunity and make sure to bring your racket! In addition, Bollettieri will take part in a Meet-and-Greet and autograph signing at the New York Tennis Expo Broadcast Plaza during the Expo. And make sure to get your seat inside the Grant Thornton VIP Lounge as Bollettieri will be co-headlining one of the two Speaker Session panels. Our Coaches Roundtable Live session will give the audience a chance to ask Bollettieri questions on a variety of tennis topics. Considered by many to be one of the best tennis coaches of all time, Nick Bollettieri has changed the way the game is played and taught at every level. He has helped shape the careers of Andre Agassi, Serena Williams, Maria Sharapova, Jim Courier, Boris Becker, Monica Seles, Anna Kournikova, Tommy Haas, and other tennis champions. His accomplishments have been imitated but never equaled. 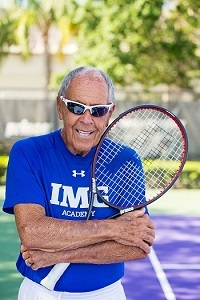 In 1978, he founded the Nick Bollettieri Tennis Academy—now IMG Academy, the first full-time tennis boarding school, providing young athletes the opportunity to train at a higher level while pursuing their academic aspirations with a focus on intense physical training, total immersion and ongoing competition among the most talented players in the world. Now the world’s largest and most advanced multi-sport training and educational institution, IMG Academy has hosted, trained and taught some of the world’s top athletes. Bollettieri continues to develop the next crop of young champions and works to bring tennis to inner-city children. The 2019 New York Tennis Expo will be a celebration of all things tennis, and will provide free fun for the whole family. From free tennis clinics to informative speaker sessions, from bouncy houses to a tennis fashion show, there will be tons of activities all day long at NYCB LIVE on February 9.